The Enterprise Content Management (ECM) Practice in the Enterprise Information Management Solutions Division is in charge of integrating all the ECM Tools that we provide in order to create one seamless, comprehensive, and appropriate ECM solution for our customers. According to the definition provided by the Association for Information and Image Management (AIIM) of which we are a member, Enterprise Content Management (ECM) is the strategies, methods and tools used to capture, manage, store, preserve, and deliver content and documents related to organizational processes. ECM practice's manage the unstructured information of an organization. Compliance, collaboration, continuity, and cost are core areas in which content and ECM are fundamental to the success of your company. For a company to benefit in these areas, it is important to make our ECM solution available to all offices, branches, business units, and departments. Our solution offers standard platform that allows IT department to offer more focused, tightly integrated solutions at a lower overall cost than minimally configured departmental solutions. The fact that ECM offers so much may also lead one to think its implementation could be more expensive. This may be true for some ECM solutions where high cost of customization makes the overall cost of implementation much higher than it was understood originally. While pursuing ECM implementations, there are some pitfalls that we help our customers to become aware of when selecting ECM solution provider. Most organizations lack the required expertise in programming and IT to handle the enormous amount of customization required in some ECM packages before the organization may realize the benefits that the ECM vendor has promised. After implementation the organization would need expert in the ECM tool in order to implement other features and monitor the system. 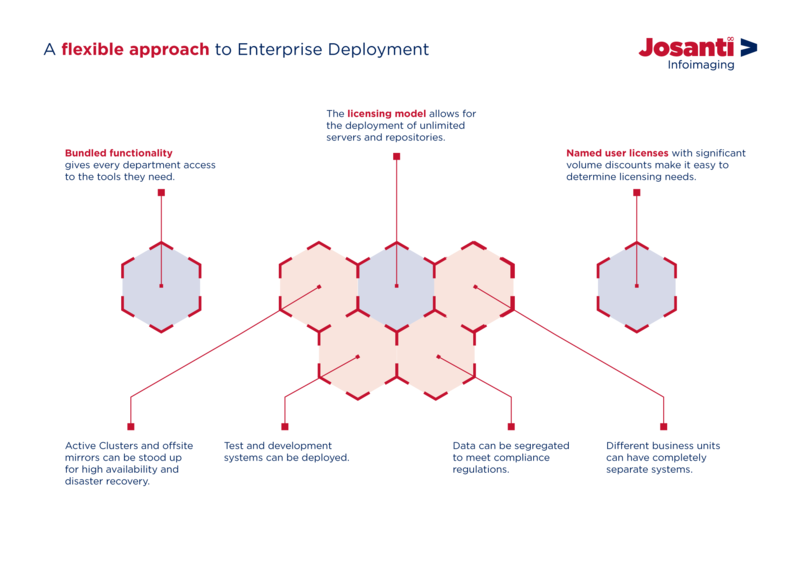 Some of the ECM vendors also do not have adequate technical expertise or the OEM simply does not allow them to go beyond certain level of maintenance, especially around the ECM database. Therefore, customers are left on their own and would sometimes need to read through hundreds of pages of documents at the ECM OEM website in the attempt to diagnose software issues. Additional cost must be incurred by bringing in third party applications and paying programmers to develop and implement custom modules before your company can set itself apart from the competition by using advanced functions in the ECM. These extra costs mean cuts into potential profits and delayed return on investment. The extensive custom code that is required in some ECM applications also puts your company at the mercy of third party developers and programmers who may not be committed in any way to the overall success of your business. Potential for poor coding is rife and can result in poor performance of not just the ECM but your business servers as well thereby adversely impacting overall productivity as in when searches would be slow and laborious. Some ECM solutions focus on sharing files and that’s it. Therefore, when it comes to creating workflows, delegating tasks, and overseeing projects, they fall short and they do not even offer integrated capture solution. In some ECM solutions your files and documents must already be in electronic format to organize them in their system. For archiving and disaster recovery purposes, it is clear such ECM solutions cannot meet a business’s needs. Another serious limitation of some ECM solutions is user’s lack of access and control of the database. The OEM must be contacted in case of errors and system breaks for it to be resolved or for the entire program to be reconfigured. The main reason Laserfiche Rio ECM is superior to most other ECM solutions out there is that for over twenty years, Laserfiche concentrated on and specialized in creating the strategies, methods and tools used to capture, manage, store, preserve, and deliver content and documents related to organizational processes. The Laserfiche ECM is an integration of best practices in all the set of tools that one requires in a good ECM solution. Laserfiche has leveraged on its rich experience to successfully provide all the tools necessary so that the customer would not need to purchase additional ECM tools from other sources. Our Laserfiche Rio Enterprise Content Management (ECM) system is a comprehensive ECM package that contains all of the core ECM technologies including document management, imaging, records management, workflow, web content management and collaboration. These tools and technologies of the Laserfiche Rio ECM, manages the complete lifecycle of content. Our Laserfiche Rio Enterprise Content Management (ECM) system is a one-stop solution that meets several different business needs. It is a complete solution to fit the flow of your organization. Instead of purchasing multiple siloes of applications to address particular use cases, Laserfiche provides an ECM foundation to handle all content-related processes. Extend the core Laserfiche strengths—information Management, document imaging, DoD-certified records Management, business process Management, system activity monitoring and Web publishing—throughout your enterprise. 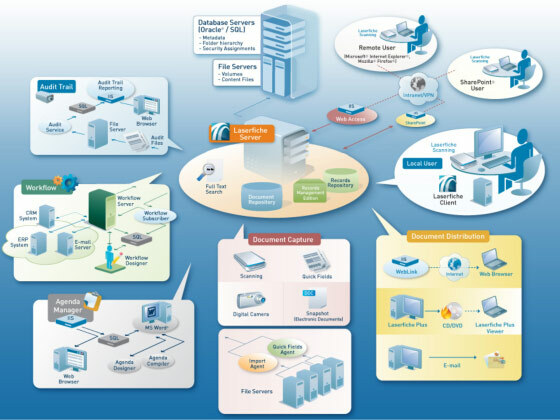 Laserfiche Rio supports unlimited servers and repositories so organizations can deploy shared repositories, individual solutions or combinations of both, based on their needs, and can define their own topology in terms of clustering failover and high availability. Laserfiche Rio was designed to meet the needs of organizations with large groups of diverse and autonomous business units that stand to realize significant ROI by deploying ECM as a foundational component of their technical architecture. The system bundles functionality so every group has the tools they need, regardless of their overall usage. With document imaging, document management, records management and workflow baked into the core architecture, Laserfiche solutions can be rapidly implemented with the functionality of a customized solution at the price point of an off-the-shelf application. And, because shared skillsets are equally important as any technology offered as a shared service, Laserfiche takes advantage of existing Microsoft standards to offer a lower total cost of ownership. Expanding your Rio system to additional departments, satellite offices or divisions doesn’t require an additional procurement—it simply involves adding a new Laserfiche Server to your existing infrastructure. The Rio system provides a complete suite of applications with a single procurement, resulting in a lower total cost of ownership. Combined with generous volume discounts, this helps your budget accurately, simplify procurement and—best of all— avoid overpayment. Cluster servers and create a failover environment to provide end users seamless access to data. Accommodate satellite offices that need their own servers. Create separate servers to segregate sensitive data. Establish a full production grade test environment that could remain alongside your production environment. Balance workflow load and volume distribution. Seamlessly use workflow to process transactions across enterprise by moving documents from one satellite officer server to another. Even without cluster servers, establish a full disaster recovery site using workflow to automatically populate it on daily basis.